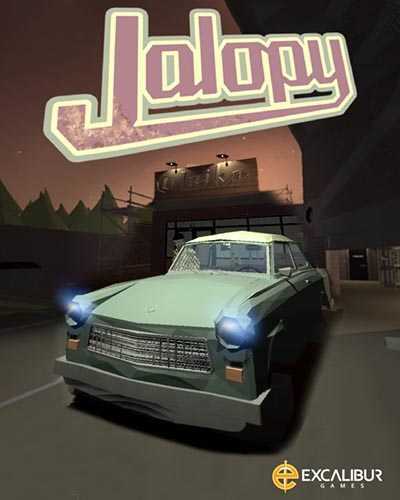 Jalopy is an Adventure, Simulation and Open World game for PC published by Excalibur Games in 2018. Roam freely with your car in the cities. This car can be upgraded with lots of items in customization system. So, You have to complete missions to get these upgrades. Navigate miles and miles of tyre changing, fuel burning, carburettor busting, mud clattering terrain, through night and day, rain and shine. Adapt to whatever the procedurally generated world of Jalopy can throw at you. Upgrade, maintain and care for your Laika 601 Deluxe motor vehicle. Keep close attention to everything from the state of your tyres, the condition of your engine and even the space in your trunk. Repair each aspect of your scrappy little car and install unique upgrades to deal with the changing world. Everything from cargo weight to the condition of your carburettor will determine how your car performs on the open road. The rise of capitalism brings an economical conundrum. Scavenge for scraps to make a small return of investment, or become a baron of the open road and smuggle contraband under the eyes of border patrols to make a sizable profit. Developer Greg Pryjmachuk worked on the Formula 1 franchise from 2009 through to 2014. In late 2014, Greg began work on this new driving simulation featuring the fictional Laika 601 Deluxe car; reminiscent of the East German “Trabbie”, it will need much love and care to keep it going on this memorable road trip! The Engine block is the core of your Laika set up. The engine block defines core performance of your laika, including top speed and acceleration. A poorly kept engine block will mean your Laika will struggle to perform. The Carburettor controls the fuel consumption of the car, which is turn controls what MPG you’ll get out of your Laika. A good, well maintained carburettor will mean you use less fuel, and can drive further for cheaper. 6 Comments ON " Jalopy PC Game Free Download "
The file is password protected how do ik the passowrd???? ?